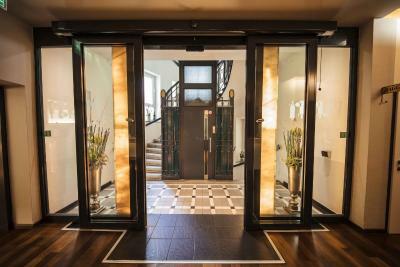 Lock in a great price for Hotel Rathaus - Wein & Design – rated 9 by recent guests! It’s an amazing, warm, welcoming place. The staff was very professional. Big thanks to Mr Jorge who made our afternoons in the wine bar unforgettable. Fantastic experience staying here!!! I would highly recommend staying such friendly staff and the best selection for breakfast!! Stella at the reception was excellent at looking after us. Will be back because of her cheerful help. 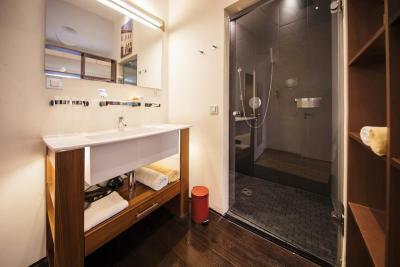 Really enjoyed the large walk in shower and having a separate toilet closet. Also, loved the morning coffee delivery! Each room is unique, we had a bathtub in the room, bath salts provided by the hotel. It was a relaxing evening in hot bath after a long day on foot. Hotel is in the close proximity to bus station. Excellent staff especially George at the bar! Excellent breakfast and the rooms are very unique and spacious! 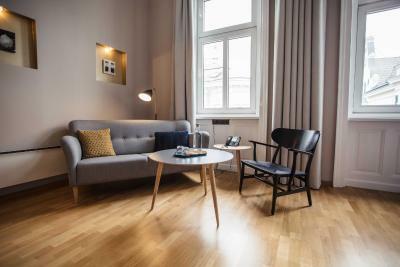 Hotel Rathaus - Wein & Design This rating is a reflection of how the property compares to the industry standard when it comes to price, facilities and services available. It's based on a self-evaluation by the property. Use this rating to help choose your stay! 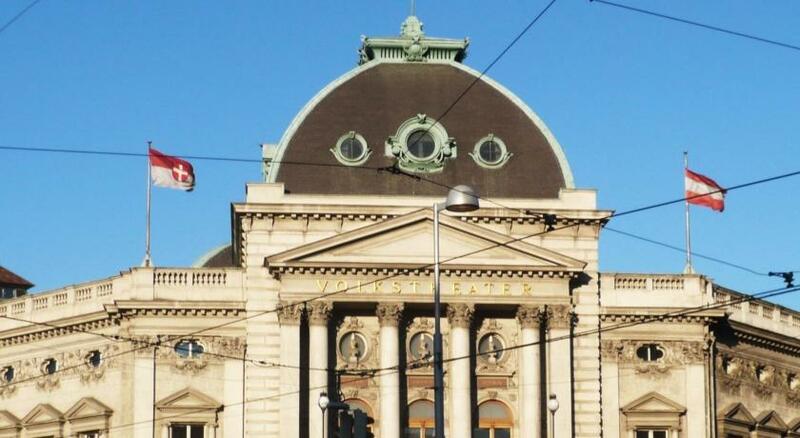 Hotel Rathaus - Wein & Design is located in Vienna’s 8th district and has an extensive wine list with over 450 top Austrian wines. 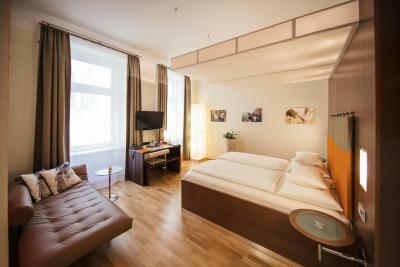 Each room is dedicated to a specific Austrian winemaker and offers some of its best-selling wines in the mini-bar. It offers free WiFi and a 24-hour reception. 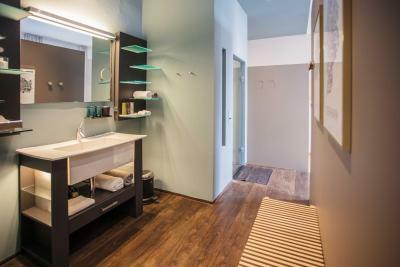 Units at Hotel Rathaus - Wein & Design are spacious and have modern furnishings and come with air conditioning and a private bathroom. 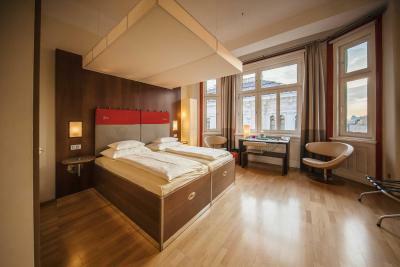 Double rooms have a mini-bar stocked with Austria’s top wines, and WiFi is available free of charge in all units. 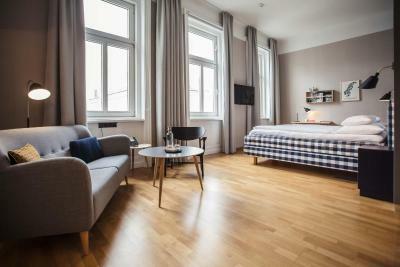 The hotel's signature room, the Junior Suite, offers Scandinavian lifestyle, including a boxspring bed from Hästens. 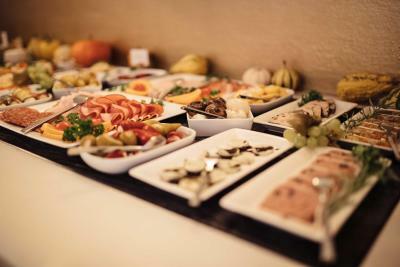 A breakfast buffet is available every morning including regional specialties, antipasti and a broad selection of cheese. 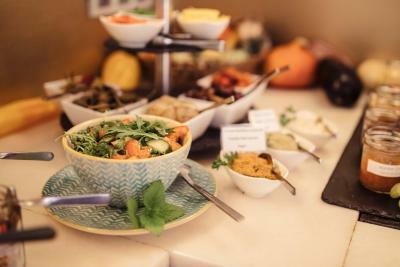 Freshly prepared egg dishes can be requested. 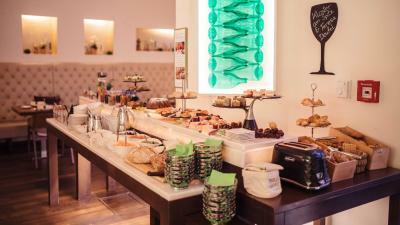 Also, guests can choose a small breakfast which offers coffee or tea and a croissant. 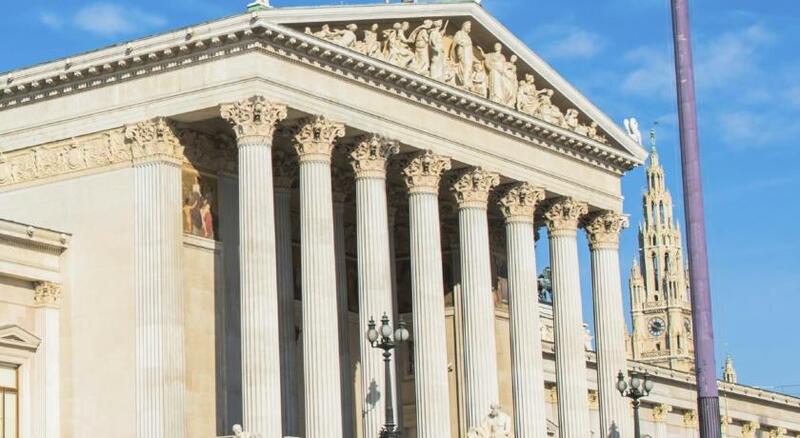 Vienna’s city center and the Rathaus Metro Station are both a 5-minute walk away. 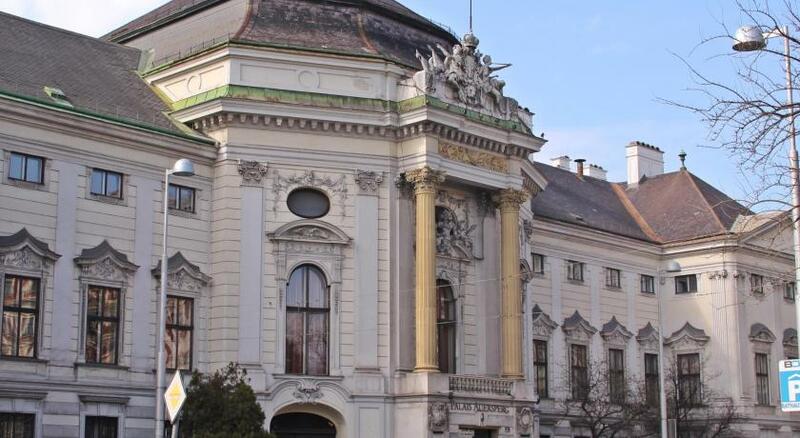 A few of the city’s attractions can be reached on foot within 10 minutes, and include several theaters, the Museum of Modern Art and St. Stephen’s Cathedral. 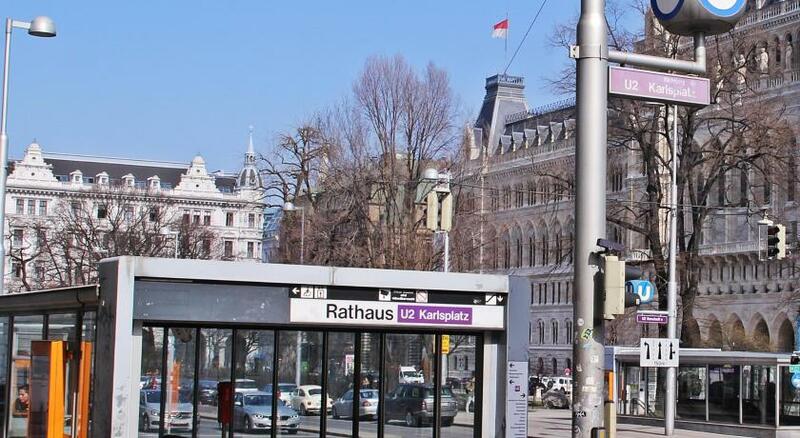 A multi-story car park is located opposite Hotel Rathaus - Wein & Design, and charges are applicable there. 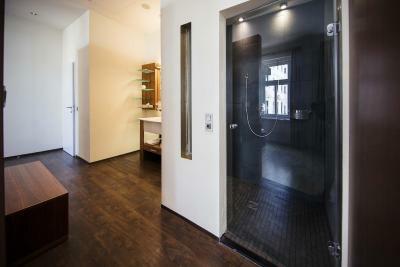 When would you like to stay at Hotel Rathaus - Wein & Design? 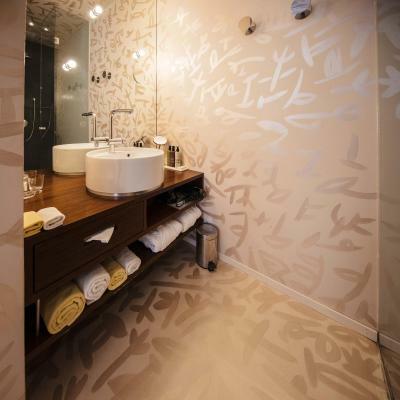 These spacious rooms have modern furnishings and decorative art and murals adorning the walls. They come with air conditioning, and a bathroom with a rain shower or bathtub. 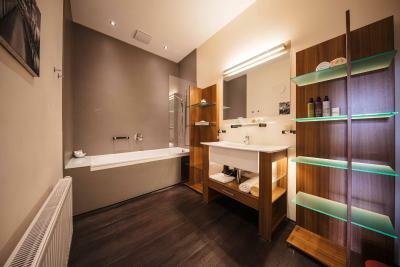 Each unit has a minibar stocked with Austria’s top wines, and rooms look out either onto the city or the courtyard. This spacious top-floor suite has a large rooftop terrace that has panoramic views of the city. The unit has 16-foot ceilings and receives a lot of natural light. A free-standing bathtub with a champagne cooler can also be enjoyed by guests. These spacious rooms overlooking the courtyard are fitted with modern furnishings and decorated with murals. 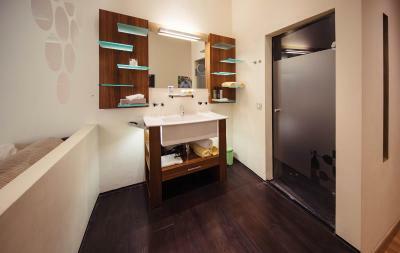 They come with air conditioning, a bathroom with a rain shower and a mini-bar stocked with high-quality Austrian wines. 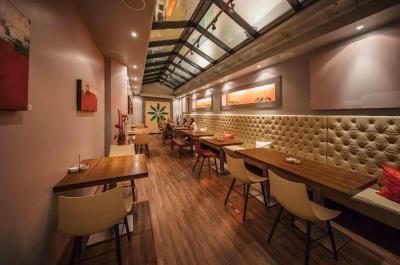 These rooms offer a cozy atmosphere located either at the ground floor or first floor. They come with air conditioning, and a bathroom with a rain shower or bath tub. 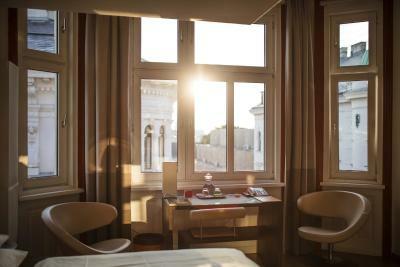 Each unit has a mini-bar stocked with Austria’s top wines, and rooms look out either onto the city or the courtyard. These spacious rooms have modern furnishings and decorative art and murals adorning the walls. 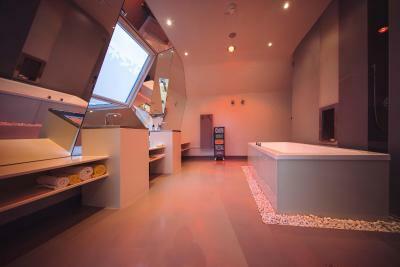 They come with air conditioning, and a bathroom with a rain shower or bath tub. 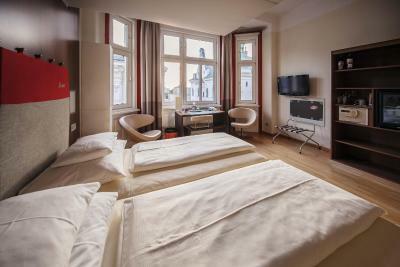 Each unit has a mini-bar stocked with Austria’s top wines, and rooms look out either onto the city or the courtyard. 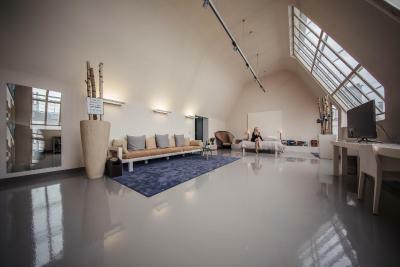 These spacious rooms with approx. 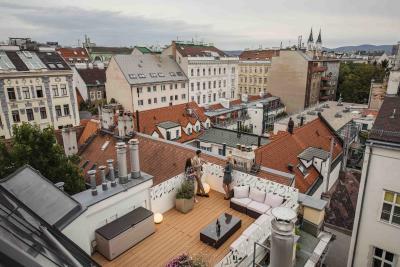 115 ft² offer a wonderful view over Vienna, located on the top floors, quiet and light-flooded. 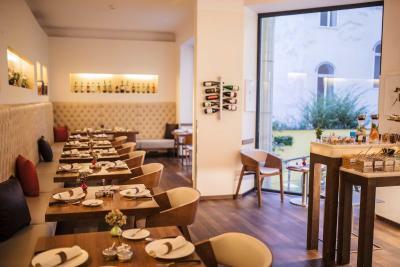 They come with air conditioning, and a bathroom with rain shower, designer chair, a mini-bar stocked with Austria's top wines, hairdryer, bathrobe and slippers, and grooming Products. 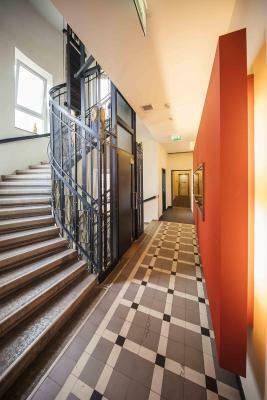 You enter the door of a building dating back to the late 19th century and then you will be transferred into a colourful, state of the art hotel devoted to our unique wine theme! Rooms have high ceilings and are decorated with wine images of our partner vintners. 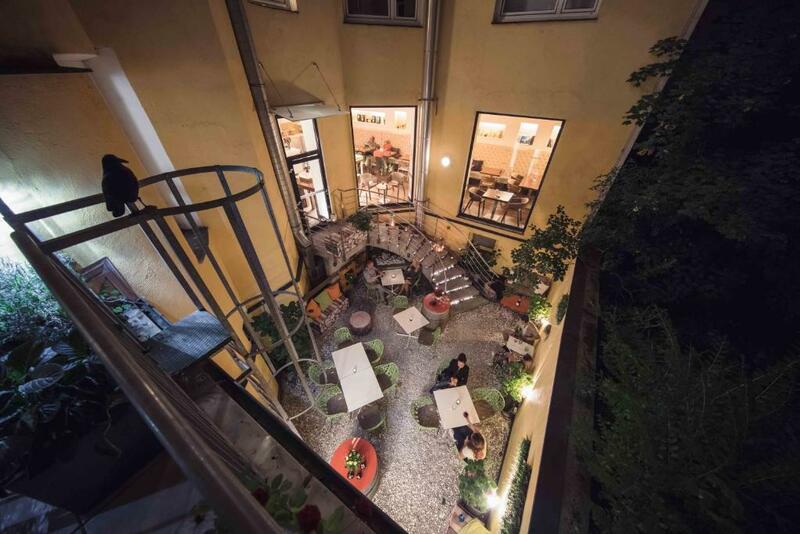 Unwind in one of the coziest courtyards in Vienna, no city noices at all. 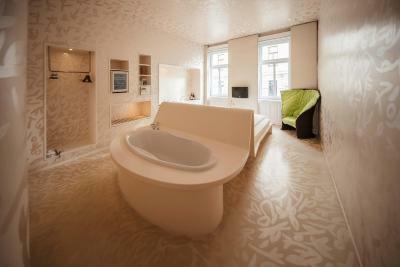 House Rules Hotel Rathaus - Wein & Design takes special requests – add in the next step! Hotel Rathaus - Wein &amp; Design accepts these cards and reserves the right to temporarily hold an amount prior to arrival. Hotel Rathaus - Wein & Design accepts these cards and reserves the right to temporarily hold an amount prior to arrival. 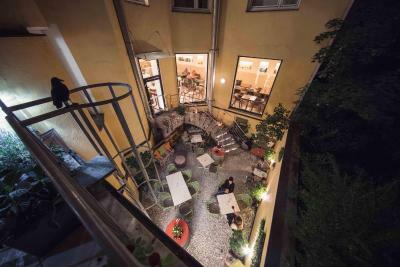 My guest and I really enjoyed our stay at this hotel: it is located within a walking distance to the city center; the rooms were fashionable, comfortable and spacious ( and the wine delicious...). It was quiet and clean. The beds were comfortable. Coffee was free. We will definitely be back!! 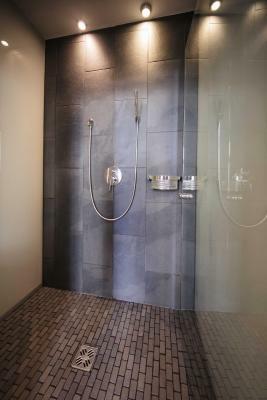 Nice spacious room with amazing shower. The staff were amazing!! They went above and beyond to make our stay very special. The hotel is in a great location, close to some really nice bars and restaurants. I would highly recommend this hotel! I was awakened ever morning by loud voices, crashes, banging from the cleaning staff and guests. Also, when I asked to confirm my check out date, the front desk person gave me the wrong date. Little problem with the bicycles on or last day; no keys for the locker and we lost 30mn of our last day in Vienna with a amazing weather outside! Not the fault of the receptionist but was just sad it happened on our last day. Room was great and breakfast amazing! A bit expensive but for one morning it deserves it. 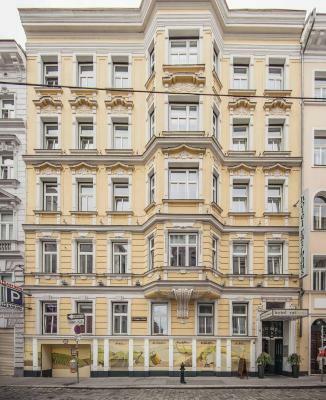 One of the best hotels in Vienna. Bed and pillows are fantastic! Breakfast also very tasty! Extremely helpful and friendly, attentive and professional staff. Gloria at reception [& others] made the stay very relaxed and enjoyable. Breakfast, cleaning, sommelier and night staff all first rate....... well done team. We ate at 2 of their locally recommended restaurants and were not disappointed. Tea and coffee brought to room quickly and without fuss. 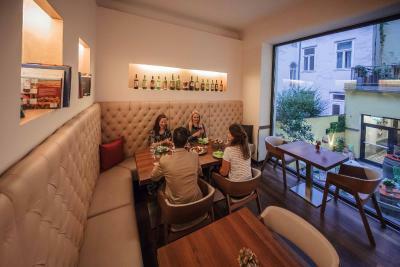 The room is spotlessly clean and quite big, wine themed in its decoration and logos, and comfortable. No usb socket for charging. However, the hotel is a sleep-only kind of hotel - there is no lobby or any common area except the cafe-restaurant (the rooftop area that looks lovely in the hotel photos is actually private and part of a room), that's almost always empty, so it is not inviting to stay and enjoy anything within the hotel premises. Leave in the morning return to sleep kind of place. 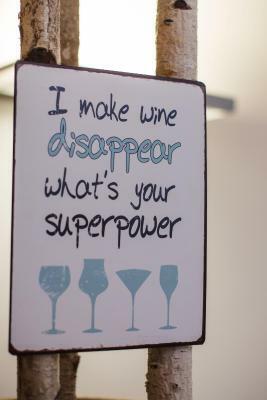 And nothing about the wine theme is free or welcoming. The most basic thing would be a free glass or tasting or a free bottle of winemaker - upon arrival, each afternoon, or something of this sort (as each room is after a different local winemaker), alas, that is not the case. 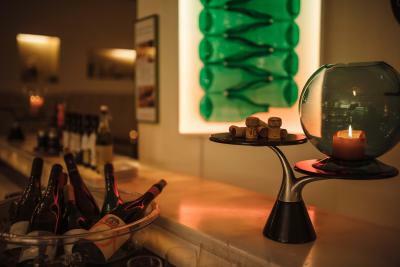 Any wine drinking would be charged extra, making it no different to any other hotel. 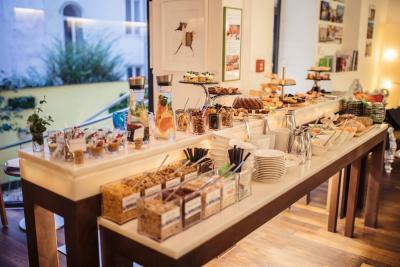 A short visit to the near by 25th hour hotel lobby can clarify the difference between them in everything having to do with lobby and welcoming mode. Also, on checkout we were asked to pay for a breakfast we never requested, ordered or actually had. When I told the receptionist I have no idea where this is coming from and asked his to check the mistake, he, very quickly and with no argument, accepted and never mentioned it again. So all the experience felt as though they were simply trying me out to see if a surcharge would work. The next day when we actually requested croissants to go with an early morning/late night coffeee, paid for the day before, the croissants were bland and in fact quite terrible. Lastly, a bottle of water for the room (it is not basic to offer one f.o.c.?) Was proced at 5.5 euro for a one litter bottle!!! I would really expect so much more from a hotel ranked this high. 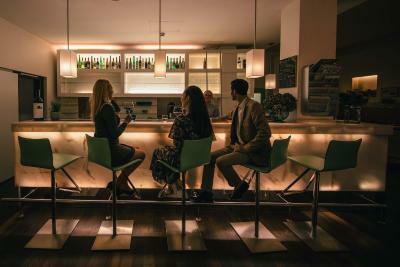 The wine concept is a very nice design concept. The breakfast buffet seems nice though we did not try. Everything is very clean and the room feels absolutely spotless. The soaps are great. 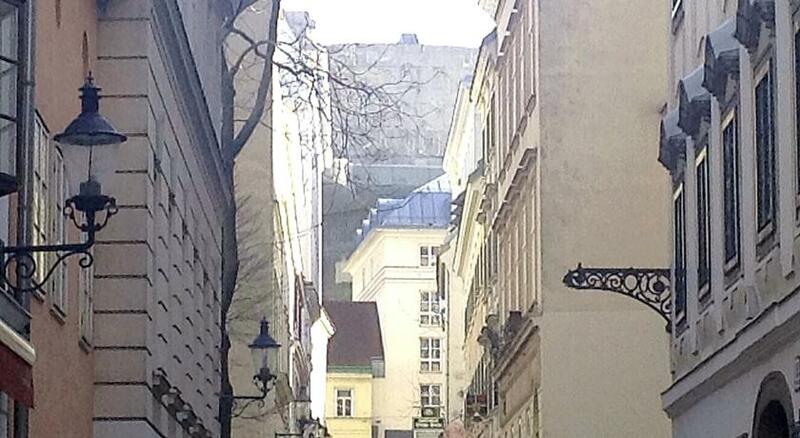 Bit far away from City center but the area is ok. Very cosy place, rooms are big and very nice decorated. Well organized, relatively big rooms & well designed hotel. Excelllent & supportive staff. Very good location. Very good breakfast. Great team on reception and running food and beverage. Friendly, informative, helpful and fun. 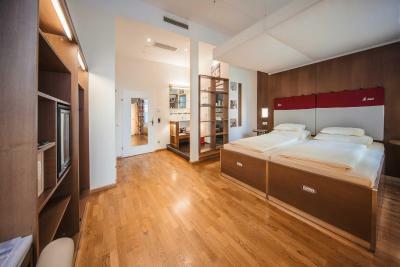 Quirk, comfortable rooms. Larger than normal. 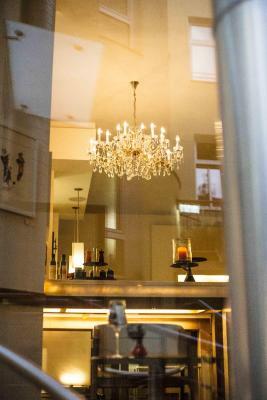 Brilliant breakfasts, and an enjoyable relaxed atmosphere in the evenings. 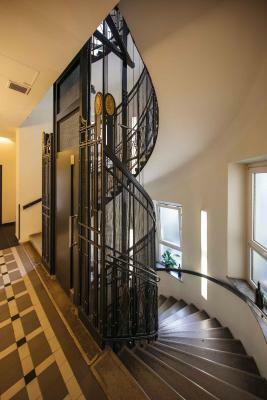 Very nice and stylish hotel with unique design. 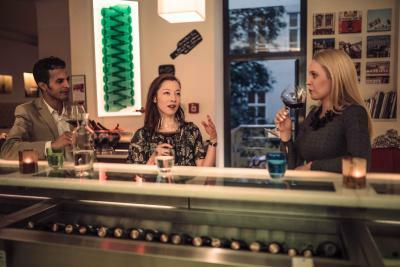 Offers great variety of Austrian wines . One side of wooden window blind didn’t work, and so the light from outside hanging light box was irritating during the night. The bath idea in the room.